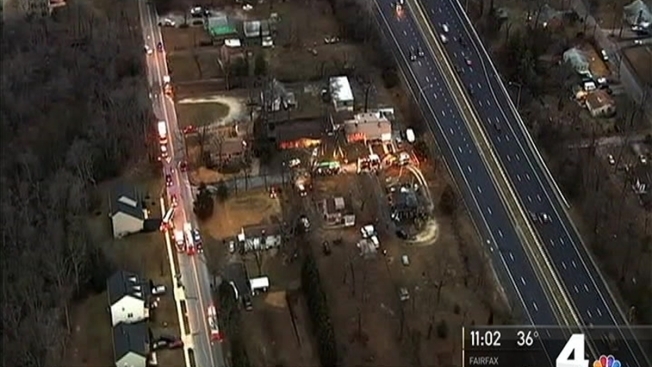 A man and woman are in critical condition after a Friday morning house fire in Clinton, Maryland. Firefighters arrived in time to pull the victims from the home on Milligan Road thanks to a vigilant sheriff’s deputy and an emergency alert app. A driver on Branch Avenue first spotted the fire around 6:30 a.m and called 911. But because of unfamiliarity with the area, the driver told the 911 dispatcher to send firefighters to Branch Avenue and Woodyard Road, an intersection that did not allow access to the home, according to a statement from the Prince George’s County Fire Department. As firefighters were dispatched, an alert went out on PulsePoint, an app that alerts subscribers to reported accidents, fires and medical emergencies where CPR is needed. Prince George’s County Office of the Sheriff Corporal Thomas Russell was a block away from the fire when he received a PulsePoint alert notifying him. Russell, who is also a volunteer firefighter, drove to the intersection and realized that firefighters had been dispatched to the wrong location and radioed dispatchers who were able to provide firefighters the correct address. Russell, who is also a volunteer firefighter, drove to the intersection and realized that the reported location was wrong. He then radioed dispatchers with the correct address, making sure firefighters were able to correct their route before they arrived at the wrong location. Russell’s actions “saved valuable minutes” in the rescue of the two victims, the fire officials said in a release. “Had it not been for Russell thinking quickly and getting us on scene and getting the fire department as quick as we could, we’d probably be talking about a whole different topic right now,” said Deputy Tyrone Macklin, one of the first responders to arrive. PulsePoint’s main purpose is to alert subscribers that there is a medical emergency within a certain radius where CPR is needed. CPR trained subscribers can reach a scene before paramedics arrive and provide CPR, improving the recipient’s survival odds. The app has helped save lives during a house fire at least once before. In 2015, PulsePoint alerted an off-duty firefighter to a house fire in his neighborhood outside of Portland, Oregon. The firefighter arrived at the scene before the fire department and was able to help a neighbor pull a woman to safety. Investigators said the fire apparently originated in the rear portion of the one-story home in the area of the kitchen. They said it appeared the fire was accidental.